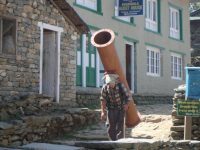 The inhabitants of the northeastern part of Nepal, particularly of the popular Solo Khumbu region at the foot of Mount Everest, belong to the ethnic group of Sherpas. About 80000 Sherpas live in this region and are the best known group of the Nepali population. About 500 years ago the nomadic herdsmen migrated into Nepal coming from Tibet and settled down permanently after the introduction of the potatoes in the 19th century. Since then permanent settlements and many monasteries, so called Gompas have been established. 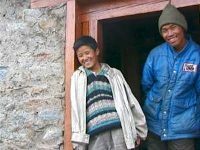 The Sherpas are Buddhist and have extremely well adapted to the hard living conditions at high altitudes. When alpinists from all over the world began to climb the almost invincible mountains of the Himalaya, their hardiness made them popular not only in the climbing community but all over the world. Sherpas have about 1 liter more blood and twice the number of red blood cells than people from the flatlands. This and the fact that Nepal has no roads and therefore anything has to be carried by people gives them an extraordinary capacity. I have personally seen a young woman literally running up a steep mountainside packed with two 20 liters water containers at an altitude of almost 5000m (16,500 feet). This ability is more than impressive. However, Sherpas must not be reduced to just that! The Sherpas are a family (regardless of its size) and not a synonym for porter! Porters are a professional group in Nepal and can come from any ethnic group! Without the massive help of these porters, their leaders and guides and their profound knowledge of the mountains, without their extreme commitment to accept such “unimportant” tasks like carrying and setting up tents and prepare food not a single mountain climber of this world would have made it to the top of highest Himalaya peaks. This is especially true for all so-called unsupported climbers! 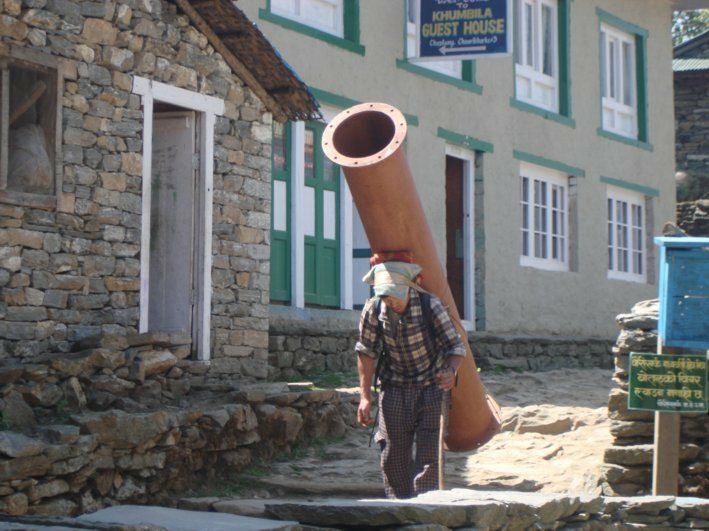 The porters of Nepal are usually paid by the load they carry. We differentiate between “trekking” and “commercial” porters. Trekking porters shall by convention not carry more than 35 kilos (because they very often climb the same routes as their paying guests!) although, depending on the trekking company or the travel agency, they very often carry up to 50 kilos. Commercial porters easily carry loads of 100-120 kilos (!!!) all day long. Unbelievable? Check the picture: the porter is carrying a water pipe of more than 100 kilos for a pipeline. 8 and more hours a day. The willingness to work hard, the kindness and the good mood of the people cannot be appreciated enough. We should be thankful and happy that there are helpers joining the tour and carrying many conveniences on their back. To avoid cultural clash, disturbance and irritation it is recommendable to be mindfull of some hints and rules.